Of all the amazing people I’ve had the privilege of meeting, Tiffany Dufu stands out. She was the president of The White House Project, was part of the launch team for Lean In and is currently the chief leadership officer of Levo. And that’s just a few highlights – her list of accomplishments is so long and impressive it would take an entire blog post to fully represent them all. But at home, with a husband and two kids, she was living, in her words, like “a Stepford wife” – trying to do all the things a “good” wife and mom does while also managing a demanding career. 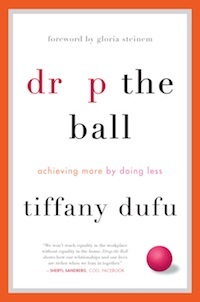 Her new book, Drop the Ball, is the story of what happened when she realized that her life had become unmanageable and that she needed to make a big change. Her detailed description of the change she made, including how she engaged her husband as an “All-In Partner,” is inspiring while also being relatable. She doesn’t blame her husband for how overwhelmed she is (and how underwhelmed he seems, by comparison). In fact, she describes how our system of gender norms is detrimental to men, too. The book is a wonderful mix of strategic frameworks – ways of thinking that will free you from unrealistic expectations – and tactics for bringing these new ways of thinking into your real life. Her detailed explanation of the Excel spreadsheet she and her husband use to track who does what, and be sure the “what” is divided fairly, is extremely helpful. But most helpful is her discussion of how that list has evolved over time – as her work and her husband’s work change, as her kids get older and their needs change. Their ongoing conversation is grounded by what Tiffany calls The Couple’s Compass – a set of values that helps guide the decisions they make as a family. And, crucially, she also talks a lot about letting go of unrealistic expectations. In fact, reading the review copy of Drop the Ball back in November inspired me to write a blog post about lowering your standards around housework. I’m somewhat lucky on this score – I’ve always been a bit lazy when it comes to domestic duty. If you are someone who can’t relax if there’s a toy on the floor, Tiffany’s description of “Home Control Disease” and how she overcame it will be eye-opening. I firmly believe that everyone – women and men, parents or not – deserves to live a rich, whole life. I believe that means having professional achievements, fulfilling personal relationships, hobbies and interests, engagement with our communities. We all have to define for ourselves what makes our life rich and whole – a privilege and a burden. Tiffany’s book offers a playbook for defining your values, unconstrained by our culture’s restricted notions about gender, and then implementing those values. If you are looking for a “how to do it all” book, look elsewhere. But if you are looking for a warm and engaging guide to achieving more precisely by not trying to do it all, this is the book for you.